In the autumn of 1963, construction works were carried out by Post Office Telephones for a new service chamber in the public pavement of London Road near the entrance to Morden Park. The opportunity was taken by the writer, in the brief time available, to examine and photograph the excavation before construction commenced. Chalk and flint layers appear to be authentic remains of the Roman road now known as Stane Street. the brief time available, to examine the excavation before construction commenced. and photographs were taken, but it was not possible to make detailed drawings. and north are recorded on the plan. Post Office Telephones – new chamber excavation – Autumn 1963.
book “Roman Ways in the Weald”. -at right angles to the alignment of the road, which was not possible at that juncture. no member of Merton Historical Society will doubt Mr Rudd’s veracity. bearing from Colliers Wood High Street to Stonecot Hill summit. the knowledge and information from this archaeological discovery. 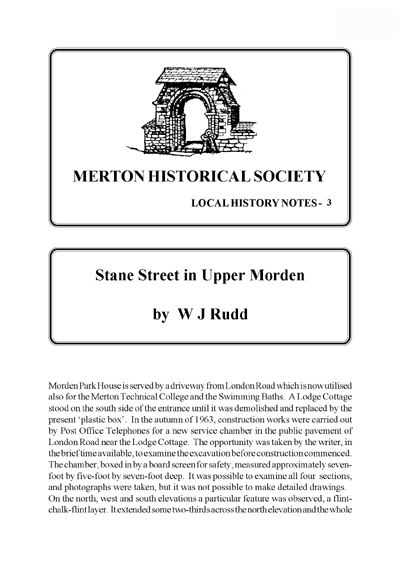 This entry was posted in Publications, Local History Notes and tagged in lhn, morden, roman Morden.